The WarMouth is the latest signature bait designed with Big Bite Pro staffer, Dean Rojas. This bait is already a proven winner as Dean used it for top finishes on the FLW and B.A.S.S Tours, including winning the B.A.S.S. Battle in April 2011. The WarMouth has a different profile and fall than any other Big Bite product. The WarMouth was designed to be fished using a Texas rig, but the bait is rigged horizontally on the flat sides rather than vertically. 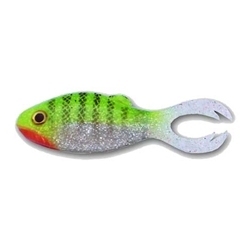 This gives it a unique profile and action on the fall that represents a bluegill or baitfish. Also, when fished this way the Big Bite WarMouth resembles a bluegill feeding on its side with its tail kicking up. This makes the WarMouth great for flipping and deadly sight fishing bait. The subtle kicking aciton of the legs also make it a great swim jig trailer. The WarMouth is compact at 3.5" in length and is designed to be fished with an Extra Wide Gap Gamakatsu worm hook.